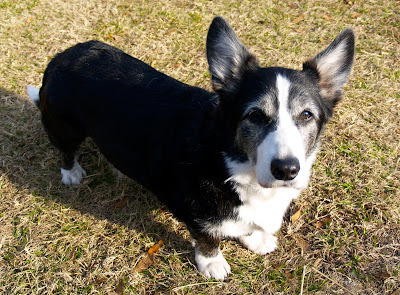 Beli is part of an article that is featured in the magazine "Dog News". It was released this week, I'm hoping someone might be able to get their hands on a hard copy for me and Rita, so if anyone is out and about at a dog show this weekend, please keep your eyes peeled! 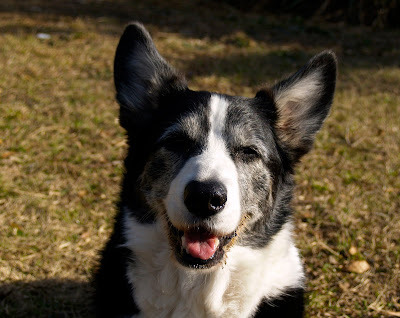 If you are interested in reading the article it is online at http://www.dognews.com/2011/012111/index2.html . The article is aptly named " Cardigans Are not Lapdogs". I've gotten lots of great updates over the past week or so. First here is Nemo, now Cooper, sacked out after having a big playtime with his big brother Jackson the Pem. I got the most fabulous update from Jay last night, he is doing fabulous there! 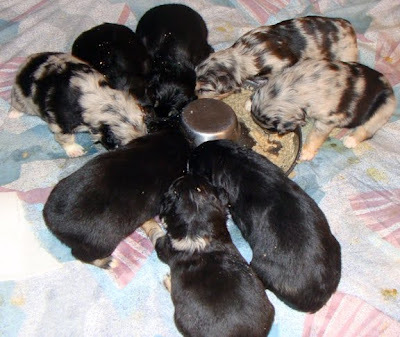 Then we got more baby Aussie pics:-)) Here they are eating their first meal, thats always so much fun for all involved. I can hear smacking puppies now...:-)) The breeders are putting great updates on their site Legends Aussies . I can't wait for the next updates! I've also gotten updates from Flora and Alice. They are both doing wonderful in their new homes. 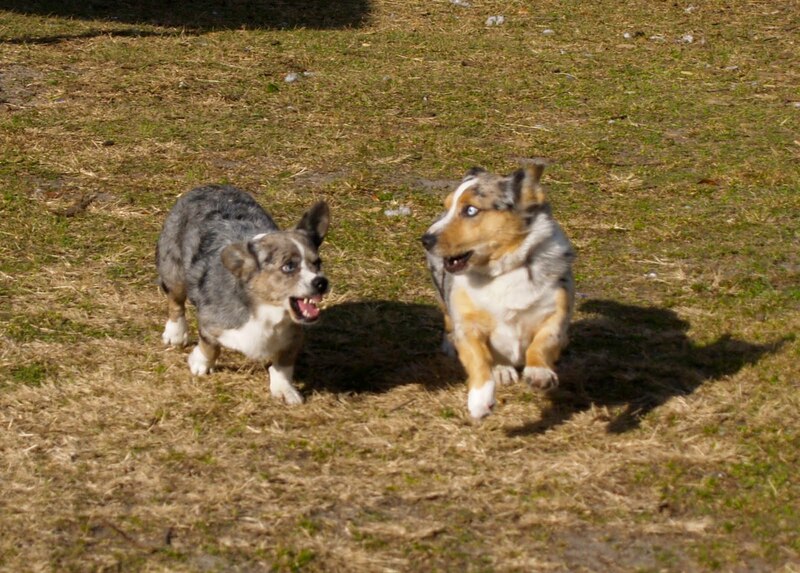 Here is a pic of Alice and her buddy Moose playing in the frigid north. Was a bust! Rosy and Abby both showed well though. 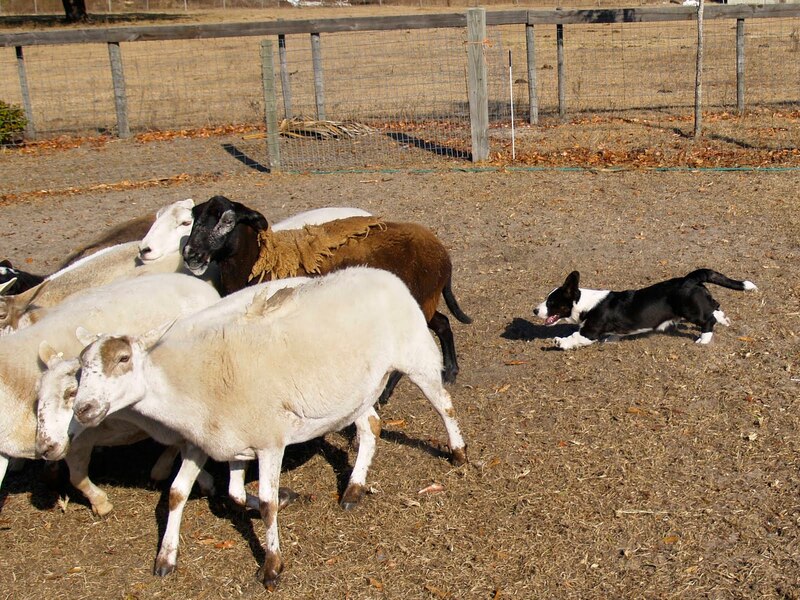 So the girls are looking forward to taking time off from the show scene to attend some herding trials this Spring. Abby will be moving up north to hopefully finish her this year, after we attend the Nationals. 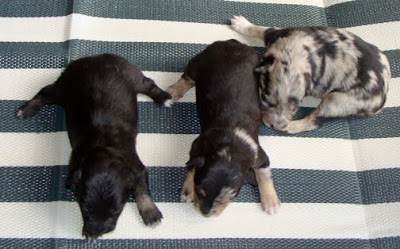 I am excited to announce that one of these three girls will be joining the Raglan Cardi clan in March! No I know its not a Cardi, she will have to deal with the identity crisis when the time comes:-)) I finally bit the bullet and decided to add 1 dog of a different breed, funny too that it is not any of those I mentioned last year when many of us posted about it. These are Aussie babies, they are almost 2 wks old in this pic. I will be driving with my friend Debby out to NM to pick her up. The excitement is building! I'll post more info as the time nears! I'm an idiot and forgot my ring time on Sat so didn't make the show.... Thankfully I didnt' break a major, I know I would've been tarred and feathered for that! Sunday was cold and damp but Abby showed really well and we were RWB. I'm happy with that and the quality of entry. So next weekend Rosy and Abby both get to strut their stuff! 13 isn't really THAT old! Well it isn't is it?? Cardigans should be allowed to live forever! :-)) So Beli's birthday is tomorrow and since I have shows this weekend I wanted to make sure I took some special pics and blogged Beli. Evy says "Dont say my Dad is old!" Beli says "Just throw the stick, really THROW IT"
"See I'll bring it back every time!" Young whippersnappers don't know what they are talkin' bout! 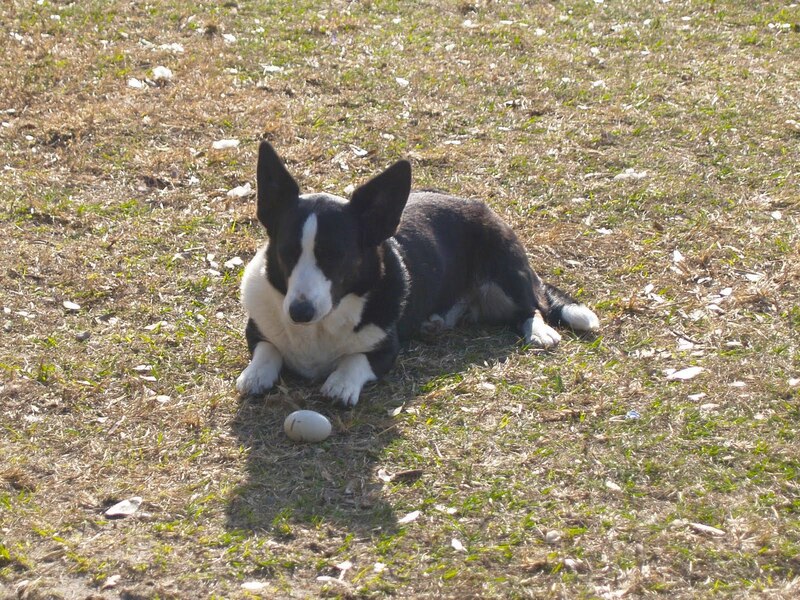 Abby says " You may be old but I'm not sharin' my egg with the likes of you!" 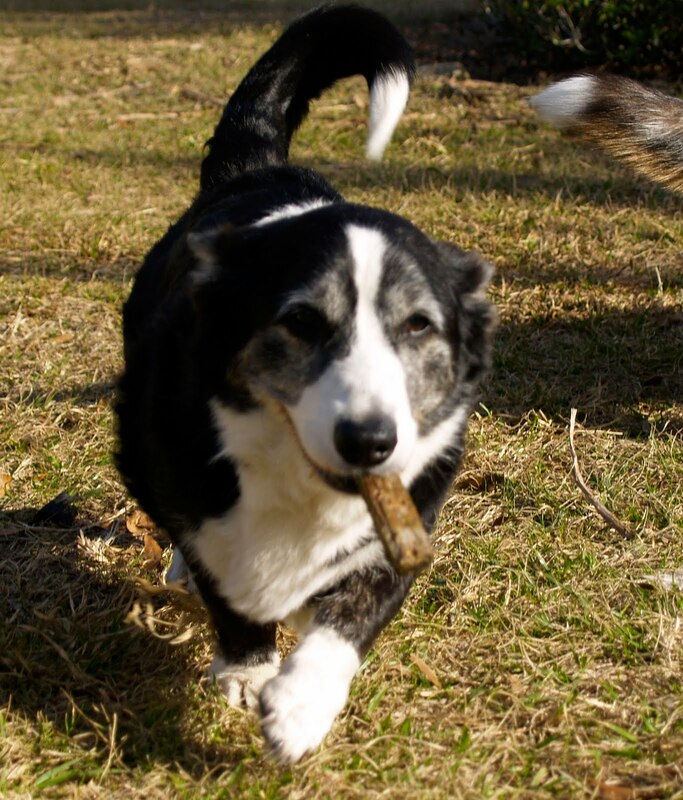 Evy " You may be my pops, but I'm not sharin' my stick either!" 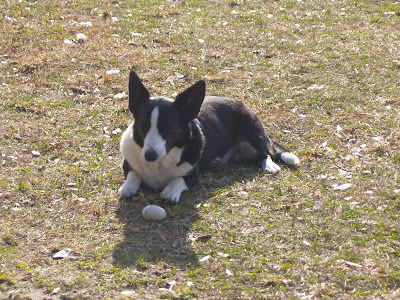 I decided to journal my herding exploits with my dogs on a seperate blog this year. 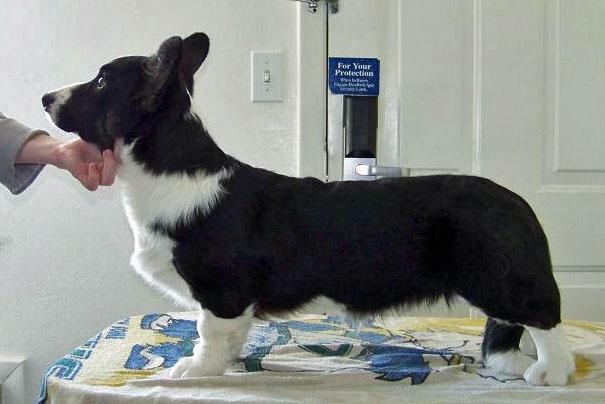 I'm going to try and post specifics about my training on each dog, hopefully I'll be able to stick with it. I tried a written account a couple years ago and it went to the wayside rather quickly... So one of my resolutions is to keep a better account this year so I can look back, as my memory fades and remember what I did to "fix" problems and work through training issues. 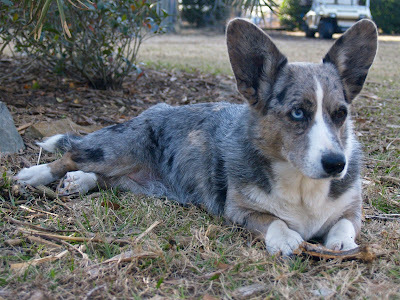 No pics to prove it but I have been working dogs everyday this week. Diane M. from MA has been here since Monday and every afternoon I've worked at least two dogs! Yeah for me and the girls:-) Sally and Rosy were yesterday and they both did pretty well. They both got to pen and do some decent outruns. Rosy just needs lots of miles before March! Sally is coming along and I'll be deciding soon whether to run her here this Spring or wait. Evy and Abby got worked today; Abby held sheep and did a couple outruns, did pretty nicely. 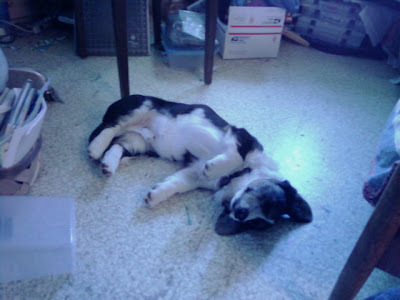 Evy worked quite a while; she did some outruns driving and shedding. Outruns could be better but I did get some flanking work done, squaring her off. Driving was ok, shedding was pretty good; still improvements to be made. 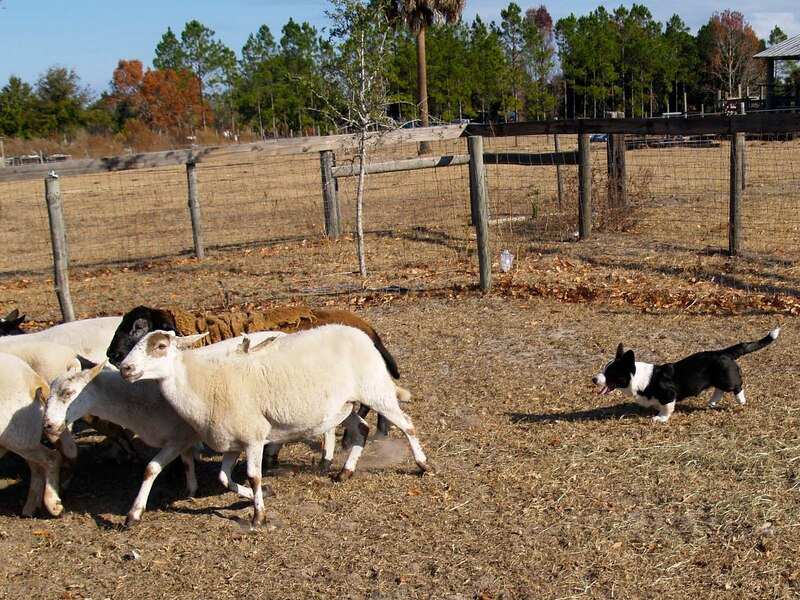 So many goals for the new year, most involve getting out and working dogs why not start the year that way? I worked every dog this morning, even the puppies! No pics of the adults today its been so long since they've been worked had to work out some kinks... Everyone did really well. 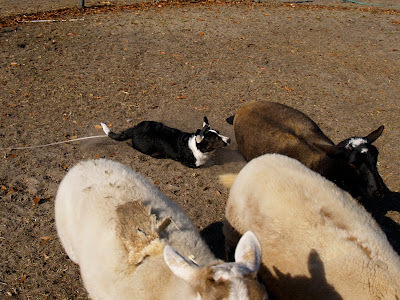 Sally did a great job shedding our working group and moving everyone to the back of the farm. Got a couple of good outruns from her too. Abby did FABULOUS! Abby took all of her flanks, did some beautiful outruns, nice driving, couple of really nice sheds too; just great overall work. 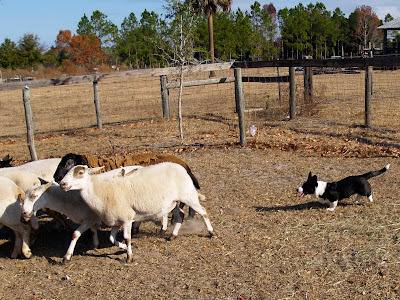 Both puppies did really well, this was probably their 2-3 time on sheep. 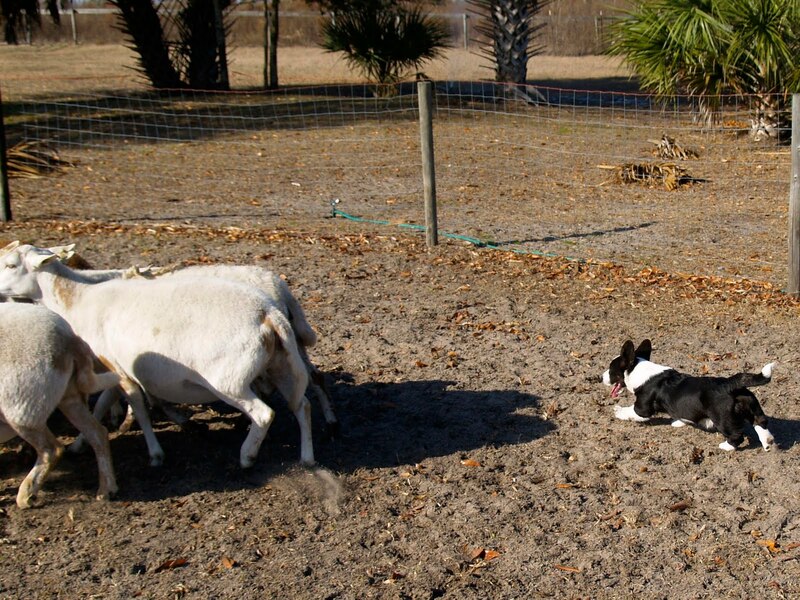 Remy is pretty laid back but doesn't mind taking hocks from time to time (or tails if they are available). Dory is very intense and focused, always wanted to find balance. She reminds me a lot of Abby and grandma Libby; that is very exciting! He's a bit slower than Dory which is good for pics, he was really boogeying to get to balance here though! 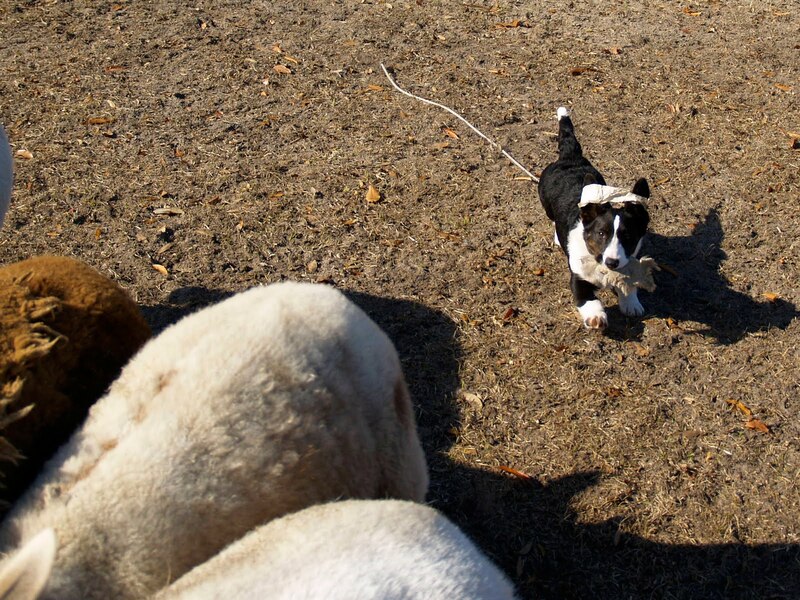 Nice distance off his sheep and going around nicely here. Yes that is sheep wool she is carrying, like I said focused! She grabbed it and kept on going, had to show it off to Remy when she was done. Rosy did some really nice outruns and flanks. No fighting today nice and smooth. Her drive transitions are really nice and she is walking into pressure REALLY well. I'm looking forward to trialling her this year! Finally Evy... Evy was rusty we had to dust out her ears for a bit:-)) She did some really nice outruns from my side in my big pasture opened up. Great job driving and shedding; even working a single and look backs after sheds. Lots of work on her before trial season but she'll do it no issue. Both Abby and Evy got a second adjustment and are feeling great, running smoothly and soundly! So we are starting our 2011 the right way with some great VERY happy dogs working the farm!